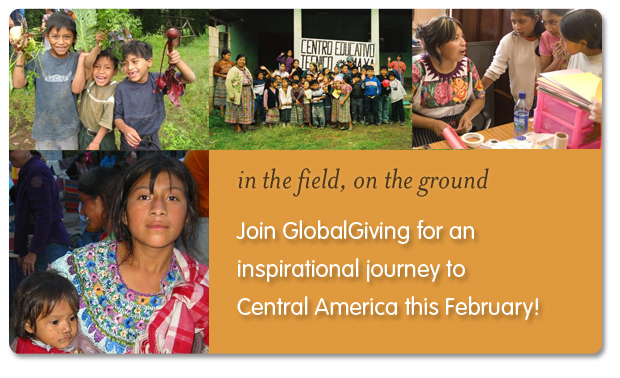 You are invited to join GlobalGiving on an inspirational voyage to three of their most influential projects in Guatemala: Long Way Home, Riecken Foundation and WINGS. This adventure will take you on a journey through Guatemala where you will have unique opportunities to connect with the people of the country and learn about real life through the work of three organizations that GlobalGiving supports and funds. See how GlobalGiving dollars go to work building a school made of recycled materials, educating poor women about options for family planning, and instilling in young people the aptitude for and love of reading. Designed by elevate destinations, the tour will also emphasize the natural and cultural beauty of Guatemala, including local markets, thriving coffee plantations, and Mayan ruins. To donate to any one of the 3 programs mentioned above – just click thru the links and give. GlobalGiving is an online marketplace for philanthropy that connects donors to causes they are passionate about, and allows them to maximize the impact of their giving by choosing how their money is used.